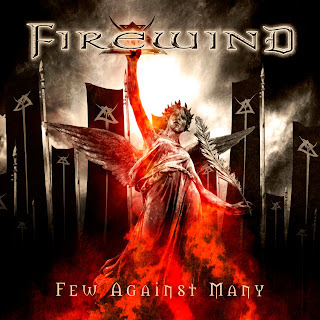 I was pretty surprised to read some very average reviews for Few Against Many, Firewind’s seventh full-length record. Greece’s most famous Heavy Metal band has always been extremely popular and respected by both fans and press. But things have changed since last record (Days Of Defiance, 2010) as mastermind Gus G. is now Ossy Osbourne’s guitarist, and Firewind will inevitably be much more exposed. You’ve probably guessed as well the main critic I read about this new record: “the songs were composed and recorded quickly, as if Gus G. wanted to profit from his joining of Ozzy as fast as possible”. Well that’s a typical Metal-fan argument, the same old “selling out” theory; but in the same time, it could be true, because we can imagine that playing with Ozzy and doing 95% of the job in Firewind (Guitarist Gus G. handles a lot of things in Firewind: composing all the music, and producing it) is a lot of work. As a fan, I decided to get that album and listen to it so that I can make up my own opinion. And after many listens, here’s my verdict: I have no idea if I like this record or not! Gus G. has been saying in interviews that he wanted to modify the band’s sound a little bit, by focusing on composing good songs, and not just rely on the heavy riffs. Few Against Many sounds indeed like a transition record, as the band seems to have intended to create something different, but without going completely through the process. The result is a patchwork of mostly melodic songs, with highs and lows. Among the good songs, I want to mention the opener, “Wall Of Sound”. That one has a great rock’n’roll vibe, a nice and heavy riff and a cool hard-rock feeling. Irresistible! I also love the second song, “Losing My Mind”, that sounds like a homage to Alice In Chains, and that clearly demonstrates Firewind’s desire to test new things. Singer Apollo does a fantastic job on that one. “Another Dimension” and “Glorious” are more typical Firewind songs, with some very fast and heavy parts and a cool melodic chorus. “Edge Of A Dream”, the ballad featuring Apocalyptica, is another cool moment, with again, a great performance from Apollo. “Long Gone Tomorrow” is different; vey heavy and sounds like an attempt to write something more modern, with a big chunky guitar riff. And as I was saying, there are some very ordinary songs here; that you pretty much forget instantly after each listen, not to mention some of them are just too cheesy like “Destiny”.